The long-awaited UK premiere of ballet The Prince of the Pagodas is the highlight of Birmingham Royal Ballet's (BRB) Spring season in 2014. There will also be a trio of crowd-pleasing, innovative dance delights with Three of a Kind. With an emphasis on comedy, this performance contains a trio of dances - Card Game, Slaughter on Tenth Avenue and Elite Syncopations. The first is titled Card Game and features music by Stravinsky. Drawing on the fact that composer Igor Stravinsky was a keen poker player, choreographer John Cranko has cleverly created dances featuring a pack of cards, which show various allegiances and rivalries, with the added touch of humour. 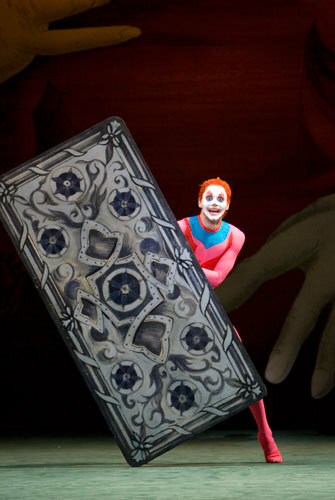 Whether it's the joker, the Queen of hearts or even a little Two of Diamonds, this performance will make you see card games in a whole new light. The second piece of the night is Slaughter on Tenth Avenue that has been put together by choreographer George Balanchine. It is a comedy set in the 1930s. It focuses on a dancer, who has found out that a hitman is sitting in the audience and waiting to shoot him as soon as he finishes his routine. Faced with this terrible fate, the dancer keeps on going until the police have time to turn up. Moving on to the final segment of the dance trio - Elite Syncopations - there is a mass of colour erupting on stage as various characters come together for a dance competition. Choreographed by Kenneth MacMillan, Elite Syncopations uses a soundtrack of cheerful rag-time songs by composers such as Scott Joplin to create a vibrant atmosphere. Three of a Kind will be performed at Birmingham Hippodrome - February 19 - 22, 2014. Tickets are available from £15 with concessions also available from the BRB website or by calling 0121 245 3500 for more information. First performed in Japan in 2011, this production by BRB has been hotly-awaited in the UK. It now gets its UK premiere during a tour across the UK including Manchester, Birmingham, London and Plymouth. Renowned David Bintley has put his mark on this ballet, which uses Benjamin Britten's only commissioned ballet score and costumes from Rae Smith, who was behind the designs for critically acclaimed theatre show War Horse. Princess Sakura of the Chrysanthemum kingdom is the heroine of this story who must choose between four wealthy men. Grieving the loss of her brother, the princess refuses to marry and runs away with a Salamander to his home city. The adventures they encounter en route prove a scintillating journey for the audience. Tickets cost from £15 and are available from the BRB website or by calling 0121 245 3500 for more information.